A woman receives food as part of a distribution in Iraq. PWS&D recently committed funding to five emergency responses in Africa and the Middle East. The projects that PWS&D is supporting are all in response to ongoing violent conflict in the regions where they are taking place. Responding through Canadian Foodgrains Bank, PWS&D is supporting partners in Juba in South Sudan, where tens of thousands of people have been displaced. One month of food support will be provided for 2,450 households (approximately 16,000 people) in locations in and near Juba. Those benefiting from the food distributions have been most affected by the fighting or are hosting displaced relatives. Households will receive maize flour, beans and cooking oil. In Burundi, PWS&D is supporting distributions of food and non-food items, as well as programs for gender-based violence and protection, social cohesion, water and sanitation, and agricultural support to ensure food security. Unrest began in December 2015, and with increased reports of abductions and killings, this assistance is critical. In Sudan, PWS&D is supporting water and sanitation, health and nutrition, emergency preparedness, education and livelihoods work in response to the ongoing crisis that continues to impact the Darfur region. Much of the population has been displaced and forced to live in crowded IDP camps—which often lack basic services—and remain in urgent need of humanitarian assistance. 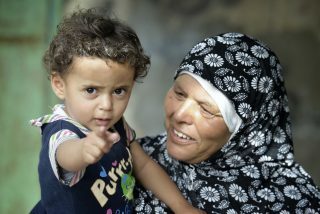 Zaher Elyan holds her granddaughter Jena in Gaza. Responding through the ACT Palestine Forum, PWS&D is providing humanitarian assistance in Gaza and the West Bank. Through agricultural and livelihoods programs, as well as health, education, water and sanitation, and psychosocial support, vulnerable Palestinians are receiving assistance to reduce their suffering and improve livelihoods. In Iraq, PWS&D is supporting work that began in response to the ISIL-induced humanitarian crisis that started in 2014. ACT Alliance members are providing crucial aid to people displaced by the conflict in Mosul. Distributions of emergency relief items and hygiene kits are part of this necessary response. Please consider making a gift to support PWS&D’s ongoing work responding to violent conflict and urgent humanitarian needs. Click here to donate.